(Season's) Greetings fellow Yoshimitsu fans and admirers! 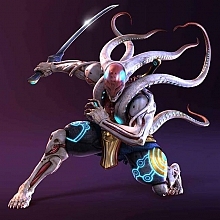 I am Aris, a big Yoshimitsu fan from Greece, currently residing in the Netherlands for PhD research. I am quite happy to see that there are other people sharing the same enthusiasm for Tekken's most mysterious and charming character. 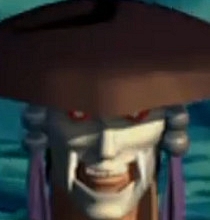 Actually, my very first Tekken memory is a Yoshimitsu one: me, about 4-5 years old, playing the original Tekken game and using Yoshimitsu against Wang. I remember being fascinated by the fact that in a game of hand-to-hand combat, there was a person using a weapon (something that was repeated a few years later when I saw Street Fighter's Vega). After that, I became delighted by Tekken 2 (my favourite Tekken game): its dark atmosphere, exceptional music, and (now) the nostalgic tones and memories of good times it evokes makes it a pleasure to play even today. I would like to add that my favourite Yoshimitsu outfits would be his P1 Tekken and Tekken 2 costumes (with the second one being probably my first choice). They both feature amazing masks (ironic and threating at the same time), while they allow him to still show elements of humanity (in Tekken 2 you can see parts of his face and neck). That's it about me. Happy to be here, and excited to see that one is not alone in their fandom. Welcome on board to Manjikai! Tekken 2 is when I started to play the game and when Yoshimitsu first appealed to me with his unorthodox fighting style and mysterious looks. Tekken 2 anyway was a great game atmosphere-wise, the long hours spent at the arcade are unforgettable. I hope you'll feel yourself at home!